The events of the last few months at which Diaglobal waspresent are listed in chronological order with links if applicable. In the mission of German Ministry of Economy and Technology (BMWi), the chamber of foreign trade of South America arranged an excursion to Argentina and Brasil from 23th - 29th November 2008. The Diaglobal GmbH was also invited to accompany this excursion to be informed about the present situation of economy and medical maintenance in these countries. We had the opportunities to present our product range and to discuss with new partners of this region. From November 19th to 22th, 2006, the 40th International Trade Fair with Congress World Forum for Medicine will take place at the Duesseldorf Trade Fair Centre. Also this time, the Medica presents a remarkable portfolio of products, topics, and enterprises – starting from innovative, small businesses to medium-sized enterprises up to Global Players. In 18 exhibition halls, the visitors will have the possibility to get to know the trends of the development in medical technology and to catch up on the new methods in its implementation. The amplification of our photometers was the main focus of the visitors’ interest, who all represented numerous different nations. Amongst others, the new Vario Photometer II, which is now also able to determine ALAT, ASAT, CRP, CK, Urea and Uric acid. at next year’s Medica 2009! Heralding a new era in Indo-German Research and Technology partnership, the German Government, Bundesministerium für Bildung und Forschung is embarking on a major Research and Technology initiative with India for the period 2008 / 2010. The Honourable Ministers for Science and Technology Dr. Annette Schavan and Mr. Kapil Sibal launched the Inauguration Event in New Delhi, which comprised of key people from the Indian and German mistries, research institutions and industry. The Diaglobal GmbH was also invited to introduce our range of products and inform the visitors about the newest developments in the field of Point of Care Diagnostic. Primary Care 2008 has an impressive 18 year track record, addressing the latest developments, innovations and opportunities within this ever changing market. Conference and Exhibition will enable to update skills, expand knowledge, put in touch with new research, treatments and initiatives and enhance the role. There are also plenty of opportunities for networking with colleagues from across the primary and community care spectrum as well as learning from examples of best practice. Healthcare Ireland is the first combined Conference & Exhibition for all involved in delivering healthcare throughout Ireland. Developed in conjunction with professional bodies and institutions, its inter-disciplinary Conference gave a wider understanding of healthcare issues and practices, and information and ideas directly relevant to healthcare. Healthcare Ireland's international Exhibition contained all the latest products and services that will enhance efficiency, and improve care now and in the future. And by sharing experiences and information with colleagues from different departments, and across the country, it developed as individuals, and improve healthcare delivery. At the booth of K-MED, our cooperation partner for Great Britain and Ireland (booth 423), we also presented our product range and our photometer to the Ireland´s market. 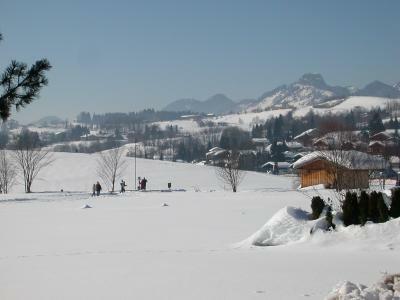 From february 10th till 17th, 2008, the 20. International Berlin Sportsmedicine Congress for Medicines and Physiotherapists took place in the cultural center of Ruhpolding. Topics where: sports as therapy, Diagnostic in sports medicine and prevention. The team of the Diaglobal GmbH carried out locally lactate tests and other diagnostic analyses (HDL/LDL cholesterol, urea, glucose et al.) with athletes of different sports. Furthermore we offerd this year again a workshop with the subject lactate and the measurements that we carried out during the sports events. From November 14th to 17th, 2007, the 39th International Trade Fair with Congress World Forum for Medicine took place at the Düsseldorf Trade Fair Centre. In by now 19 halls Medica this year broached the issue of all topics of ambulant and in-patient medical care. Focuses where: Electromedical equipment, medical technology, Laboratory equipment, Rescue and emergency equipment, Diagnostics, Drugs, Physiotherapy, Orthopaedic technology, Facility management, Textiles, OR equipment, medical furniture and equipment, Single-use products and consumer goodes, Information and communications technology, Premises and building technology, Services and publications. Like every year, the Diaglobal GmbH presented also its product range on its own stand at the Medica . We introduced our range of products and informed the trade visitors about the newest developments in the field of Point of Care Diagnostic. We hope all visitors had a successful and informative Trade Fair ! This year’s 40th German Sports Physicians Congress of the German Society for Sports Medicine and Prevention took place under the slogan „Sports medicine – between competitive sports and clinical medicine“ in Cologne on September 27th to 29th. This event is traditionally not only a comprehensive continuing medical education but mainly an interdisciplinary scientific forum for all subareas of sports medicine. Scientific lectures, innovative poster presentations with short lectures, plenary and focal point lectures, practice oriented workshops, and certified continuing medical education setted up the programme. The congress included a trade show where also the Diaglobal GmbH was represented with its products. Among other things we presented the new Lactate photometer plus which shows the haemoglobin value immediately on the display during the lactate measurement. Thus it does not need to be measured separately. Furthermore the device is able to measure also glucose directly on location during training. In addition we cordially invited you to get to know our new CK photometer. This photometer is a valuable supplement to training observation because, for the first time, it allows the photometric CK measurement from capillary blood (60 µl). We conducted locally this and other measurements at our booth – thank you for your visit ! We hope all visitors had a successful and informative congress ! health care management, medicine and nursing met on various expert congresses at the ICC Berlin in order to discuss trends and perspectives of this market. The exhibition forum have been the congress’ areal centre and the frame of the numerous expert events. Various companies have attend the forum in order to give proof of their proficiency and thus of the diversity of the industry’s efficiency. Also this year the Diaglobal GmbH have attend the Capital Congress. Besides our approved system you also found the new developments of our product line, in particular in the areas prevention and possibilities for the reduction of health care costs, at our booth. for “the health and welfare of the horse”, held December 2nd to 6th in San Antonio, Texas, USA. attended the world’s biggest convention of this character. 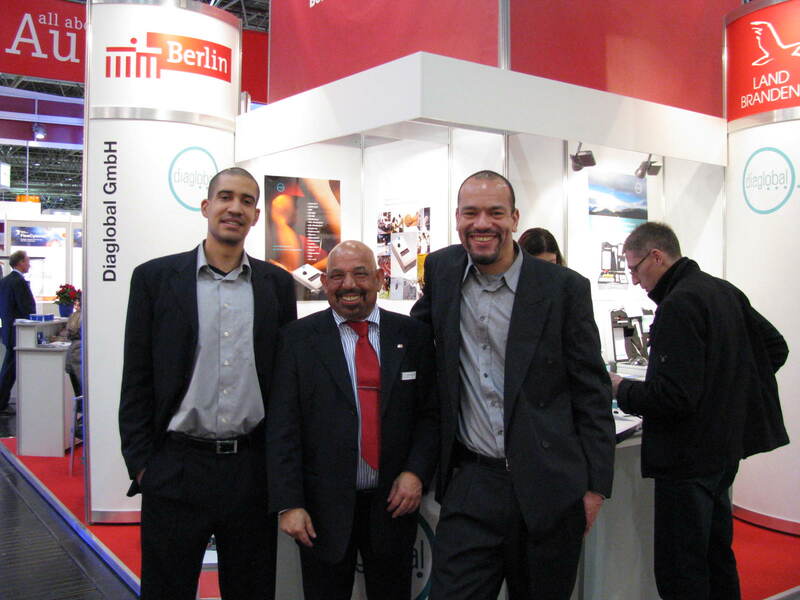 The Diaglobal GmbH presented its products on the industrial exhibition which was held parallel to the Convention. We thus could introduce our know how for the first time on the American market and were able to raise great interest. 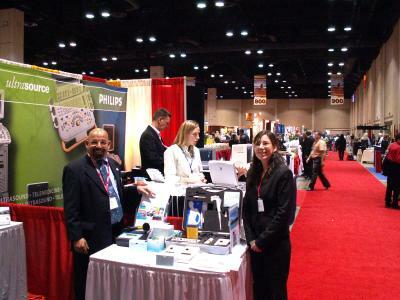 The AAEP 2006 resulted to be a complete success for us and we are already looking forward to the next AAEP, held December 2007 in Orlando, Florida! 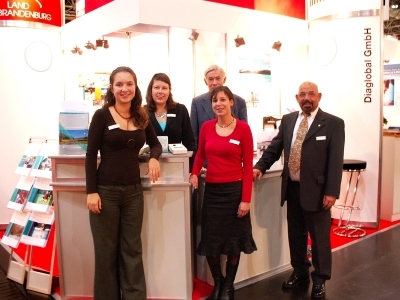 From November 15th to 18th, 2006, the 38th International Trade Fair with Congress World Forum for Medicine took place at the Duesseldorf Trade Fair Centre. Also this time, the Medica presented a remarkable portfolio of products, topics, and enterprises – starting from innovative, small businesses to medium-sized enterprises up to Global Players. In 18 exhibition halls, the visitors had the possibility to get to know the trends of the development in medical technology and to catch up on the new methods in its implementation. Like every year, the Diaglobal GmbH was also represented with its own stand at the Medica. We introduced our range of products and informed the trade visitors about the newest developments in the field of Point of Care Diagnostic. The amplification of our photometers was the main focus of the visitors’ interest, who all represented numerous different nations. Amongst others, the new Lactate Photometer plus, which is now also able to determine glucose and to calculate automatically the haemoglobin value, and the Homocysteine Photometer, which determines homocysteine, CRP, and CK, found general approval. at next year’s Medica 2007! On the occasion of the FEI World Equestrian Games 2006, the ESpoM (Equine Sports Medicine), an international congress for veterinarians and farriers, taked place in Aachen from August 23 to 26, 2006. During numerous seminars and scientific lectures you have been introduced to the progress in equine sports medicine and presented the latest knowledge. A commercial trade exhibition, which accompanies the congress, with many participators from the pharmaceutical industry, medical technology, and suppliers from farriers material completed the programme from August 24 to 25. The Diaglobal GmbH with its know how has also been represented at the exhibition. 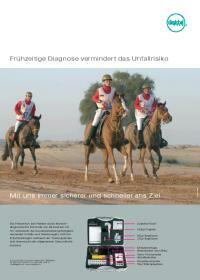 At our stand we informed you about our products for equine sports and presented you our latest developments. The MicroTechnology, trade fair for microsystems and nanotechnology, was a part of this year’s Hannover Messe, which is considered to be the most important technology event of the year. With 50 exhibitors from seven nations more businesses than ever have participated at this year’s MicroTechnology. The German Federal Ministry of Education and Research (BMBF) supported the domain of microsystems technology with an own fair project and authorised the VDI/VDE Innovation and Technik GmbH to realise the project. - examples for important sportily relevant parameters that may be determined directly locally with the Diaglobal system in form of a rapid test: lactate, urea, protein, haemoglobin, blood sugar et al. On February 26, 2006 the Olympic Winter Games of Turin finished with a colourful farewell party of entertainment. The German athletes recaptured their crown with a stupendous final spurt and went back home as the most successful team with 29 medals. Also we are proud of the success of the German team and hope to have them served well with our equipment during the exhausting days of the event. 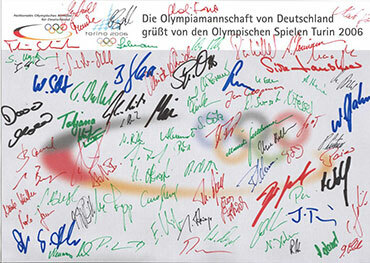 We are happy about the athletes’ fantastic collection of signatures and grateful for the collaboration. We would like to say good-bye and welcome you again in February 2010 in Vancouver, Canada. Also this year the 18th Berlin Seminar on Sports Medicine for physicians and physiotherapists in Ruhpolding was a complete success. 170 sports physicians (and those who wish to become one) participated in the seminars in winter environment. The team of the Diaglobal GmbH carried out locally lactate tests and other diagnostic analyses (HDL/LDL cholesterol, urea, glucose et al.) with athletes of different sports as, for example, indoor football and, in form of field tests, with biathletes and cross-country skiers – with an environmental temperature of 10 degrees below zero! Our workshop with the subject lactate and the measurements that we carried out during the sports events aroused great interest in the participants and induced the organiser to invite the Diaglobal GmbH also for the next year. Needless to say that we are happy to participate again; the dates will be announced by us in due time. 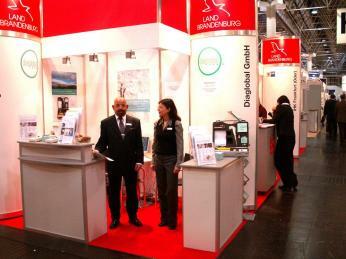 The largest medical trade fair in the world in Düsseldorf, Medica, was a great success in 2005. 137 000 delegates from around 100 countries attended over the four days of the trade fair to discover the latest trends in the development of medical technology and obtain new information on new methods of application. We were at Stand 3 in Hall G54 with a variety of information in the area of point-of-care diagnostics. One of the greatest attractions for visitors was our on-site measurement of the metabolic syndrome, where the test subjects received a printed record of the measured data in less than 15 minutes. It was surprising to note that the values of some visitors were outside the normal range, in spite of the fact that they felt perfectly healthy. Another attraction at our stand was the mobile laboratory, which is designed for use in areas of conflict and after natural disasters. It was of great interest to visitors from developing countries and countries with poorly developed infrastructure. Numerous visitors with an interest in sport were interested in the Vario photometer, which can be used to measure the lactate performance curve and other parameters relevant for sport such as urea, haematocrit, glucose and many others. Once again Medica provided our company with numerous opportunities for contact with our customers. We had useful discussions and arranged many meetings for the future. The Association of German Endurance Riders and Drivers is organising the Endurance Veterinarian Meeting and the annual general meeting on 11.11.-12.11.2005 at the Hotel Freizeit Auefeld in 34346 Hann. Münden (Hesse). Diaglobal GmbH supports the event with the "Mobile Laboratory"
"Future Ways to Help" we presented the Health Care Case - the "Diaglobal Mobile Laboratory" for countries with extended rural areas and a poorly developed infrastructure. After various presentations and a tour through the office and business area visitors ended the evening with a lavish buffet and were entertained by an Indian dancer. Presentation of the Health Care Case - the "Diaglobal Mobile Laboratory"